Anantara Kihavah Villas is an incredible island destination with beautiful sandy beaches, a spectacular overwater spa and a unique underwater restaurant. 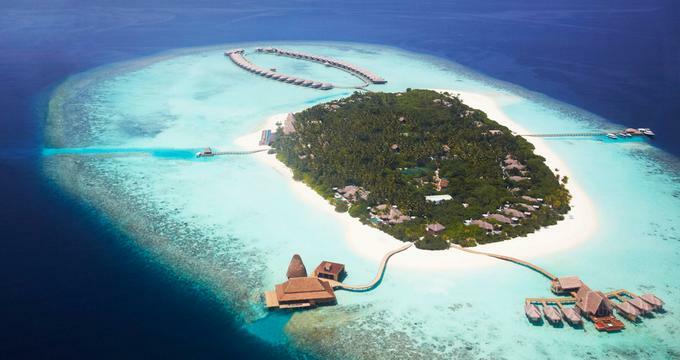 Plan a luxury island honeymoon to this beautiful destination in the Maldives. Kids are welcome on the island. The resort offers a selection of beach villas so that the little ones can be just steps from the giant sandbox. The ocean and the coral reef around the island is full of wonder: colorful fish, turtles, dolphins and other sea creatures. The private island is home to ultra private villas with pools, either set on the sandy beach or over the blue lagoon. The overwater villas are among the most luxurious in the world where you can enjoy unobstructed ocean views from virtually every angle. Take a bath in the oversized bath tub which is perfectly positioned behind the pool, giving you fantastic Indian Ocean and pool views as you relax in the tub. The Overwater Villas have high ceilings and hardwood floors, his and her walk-in wardrobes, wine chillers, private pools and sun decks. Click here for more awesome honeymoon villas. Beach Pool Villas are great for families. The villas are set right on the sand and are decorated with Thai silks, rich earthy colors and elegant wooded accents. Bedrooms feature Egyptian cotton and the luxurious "bedding by design" menu that lets you choose your own pillow and other amenities. Beach villas have a Bose sound system, wine chiller, iPod docking and espresso machine. Baa Atoll is a UNESCO World Biosphere Reserve, home to a fragile ecosystem with colorful coral reefs, a diverse marine habitat and pristine beaches. The hotel has initiated the Coral Adoption Program designed to share learning experiences with guests and accelerate the regeneration of coral growth in the atoll reef. Guests have access to a variety of Beach Sports, including snorkeling, kayaking, beach volleyball tournaments, badminton and table tennis. The chefs at the resort can design a special cooking class just for you, letting you learn how to prepare traditional Maldivian dishes such as the huni havaadhu curry and freshly caught seafood grilled to perfection. The resort has a fitness center, Library and Business Center, tennis courts and guided yoga sessions. The Kihavah pool, set on the ocean's edge, is a place to relax, swim laps and get fresh fruit brought to you by the Sunshine Butlers. Located in a separate complex built over the water, the beautiful island spa offers some of the most magnificent ocean views in the world. The spa has 6 over-water treatment suites, perfectly built to offer unobstructed views of the Indian Ocean. After a massage, take a soothing bath in the huge round bath tub from which you can see the coral reef below. Custom made oils relax and rejuvenate the body and mind with their soothing fragrance. Close the privacy curtains as you take a bath, or leave them open to enjoy the view and gentle island breezes. Couples can book a side-by-side massage or another couples treatment, followed by a relaxing soak in the bath. There is plenty of space for two. Order a cool tropical drink and enjoy the magic of the moment. The specially built spa relaxation deck has a jacuzzi on the water's edge and plush chairs where you can sit and unwind before and after a treatment. Built on stilts with natural materials, the relaxation deck and the spa complex as a whole provides a unique relaxation spot surrounded by nature. If you are a lover of the ocean, it literally does not get any better than this. Spa treatments are inspired by the ocean. Specialized treatments like the Anantara Synchronized Massage guarantee a once in a lifetime experience at this fabulous spa. Whether you want to dine under water, surrounded by colorful tropical fish, by the pool or on the beach, the resort offers many choices. The signature underwater dining complex includes a restaurant and wine cellar which serves gourmet cuisine and fine wine. The Sea Restaurant is an amazing underwater eatery where you can dine surrounded by colorful tropical fish all around you. The restaurant serves gourmet dishes paired with some of the best wines from around the world. Before dinner, stop for drinks at the overwater bar which sits on a platform surrounded by clear blue waters of the lagoon overlooking the Baa Atoll. If you are looking for a unique wedding destination, say "I do" under water at Sea Restaurant. The wedding package (from USD $5,890) includes all the important details. After the wedding celebration, spend a romantic honeymoon on at the beautiful resort where you can enjoy snorkeling, diving and pampering at the unique overwater spa. Stay in one of the luxury villas on the beach and celebrate an unforgettable honeymoon. You may also like the undersea restaurant at Conrad Maldives Rangali Island. Villa rates start at $1,230 per night. Other great resorts in the area include: Coco Palm Dhuni Kolhu Maldives, Four Seasons Resort Maldives at Landaa Giraavaru, Kihaadhuffaru Maldives, Soneva Fushi, Reethi Beach Resort, Royal Island Resort & Spa Maldives and Dusit Thani Maldives.